By admin at May. 3. 2012. Stating seeds for annual plants is relatively uncomplicated. The seed goes into sterile soil or artificial medium, you give it some water, place it in a warmish place and after a while germination occurs. Having mastered germinating annuals, many gardeners eventually have the thought that if they start their perennials from seed they can, with a bit of patience, get lots of plants for a small price. So they go through the same procedure that they used on their tomato plants and nothing happens. While many perennial seeds will germinate with no more difficulty than annuals, some are reluctant to break dormancy. This is a survival mechanism that insures that the seed will germinate when conditions are right for the plant to survive. One of the keys to breaking the dormancy of seeds is stratification. Stratification subjects the seed to a cold, moist period that simulates winter and convinces the seed that spring has arrived and it is time to grow. There are a number of ways to stratify seeds. The one most home growers use is to put the seeds into a plastic bag or lidded jar that contains vermiculite or other sterile medium, moisten it and pop it into the refrigerator for a time that is appropriate to the type of seed being germinated. Paper towels can be used for smaller seeds but unless they are sterile fungus tends to grow even in the refrigerator. The time period needed for stratification is dependent on the seeds being grown. It can be as short as three weeks or as long as three months. The seeds should be checked periodically for germination. Some will germinate in the refrigerator and once germination starts they should be planted. Plant them in sterile soil to eliminate damping off and other fungal diseases. This is a practical method for larger seeds but is mechanically difficult with smaller ones. It will be impossible to separate the smaller seeds from the medium for planting if vermiculite or peat moss is used. The roots of the tiny seedlings will often grow into the weave of the paper towel and separating them can cause damage. If the room is available it is probably better to put smaller seeds directly into a plug or small pot, put the whole thing in a plastic bag and refrigerate. Another way to stratify seeds is to actually plant the seeds outdoors so that they undergo natural stratification. Some seeds actually need warming and chilling before they will break dormancy. Planting them outdoors provides these conditions with the least fuss. This method is much easier for seeds such as those of the peony, which need a double stratification. During a warm period of approximately 3 months the root develops from the peony seed. The plant must then be subjected to a cold period before the shoot grows. Seeds can simply be planted in a bed in the fall, or in the case of poppies, scattered on the last snow of winter. Since planting in the ground results in the loss of seeds this may not be the best method if only a few seeds are available. A safer method is to fill a pot with sterile soil or an artificial medium and sink it into the ground in the fall. Plant the seeds and cover the pot with screening to prevent interference from animals or washing away in hard rains. 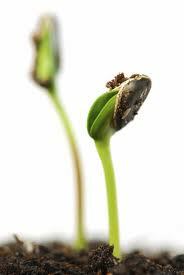 The seeds should germinate in the spring and can be transplanted when they are big enough to handle. An unheated out building can also be used to stratify seeds by either of the above methods. The seeds must be protected from mice and checked frequently. The pots should be put in plastic bags to maintain moisture. Seeds stratified this way will often germinate very early and will quietly pass away if not removed to a lighted more hospitable location. The need for specific temperatures is not the only thing that will keep a seed from breaking dormancy. Some need to have chemical compounds that keep them dormant soaked out of them. Many have seed coats that are so hard that they need to be scarified before water can get into the seed. We recommend rubbing this type of seed between sandpaper as attempting to nick them with a knife tends to send seeds shooting off across the room. There are even seeds that need to be subjected to fire before they will germinate. To avoid disappointment check what method is required to germinate those seeds before you plant them.